Two recent acquisitions have provided artifacts currently on public view in the Msgr. William Noé Field Archives & Special Collections Center, first floor, Walsh Library, Seton Hall University. The old St. Peter’s German Church, Belmont Avenue, Newark, supplied many items that afford a view of pre-Vatican II worship. There are two memorial patens, still used in the service of Holy Communion, along with two intinction cups. Hosts would have been placed in the bowls, and wine in the cup within the bowl, so the priest could dip the host into the wine before placing it on the tongue of the communicant. There is a stole, worn with priestly vestments during mass and a maniple which would have been worn over the priest’s left arm while serving mass. Reflecting the placement of the altar at the back wall of the sanctuary before Vatican II moved the altar forward, so the priest would face the congregation during mass, there are two altar cards. These were framed Latin script which would be hung on the wall beside the altar for the priest to read during the service. The Sacerdos Infundit vinum would have been read as the wine was poured into the communion vessels. At the end of mass, the “Last Gospel”, the Initium Sancti Evangelii Secundum Joannem, John I:1-14, would be read. These two altar cards offer a glimpse of the fine German woodwork throughout St. Peter’s church in these intricately carved frames with running ivy leaf forms. An example of an illuminated Communion certificate from 1895 complements the German woodwork of the frames. Completing the items used in serving mass is a silver tray [damaged by water] and one of its two cruets. The silver handle and top of the cut glass cruet with grape leaf motif show that this one was for wine, where the one for water is missing. Accompanying these sacramental items are two fine examples of parish life. The tabernacle crucifix was presented to Rev. A. Stecher on the occasion of the 25th Anniversary Jubilee of the church building in 1897. 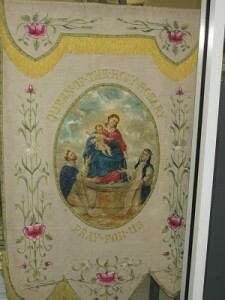 The Altar Rosary Society Banner from 1922, handpainted and embroidered on silk, completes the collection. In the other case are the time capsule, a rectangular tin box from the cornerstone of the Chancery building on Mulberry Street, Newark. Though the time capsule was sealed, moisture was still able to seep into the box as can be seen in the decay of the lining of the box which contained the bronze Immculate Conception Seminary medal fom 1927 with Bishop O’Connor on the reverse, and on the remains of his calling card which was with the medal in the box. A protrait of Bishop Thomas J. Walsh who became Archbishop in 1937 when the Diocese of Newark was elevated to Archdiocese, also shows some decay. Two newspapers, The Catholic News and The Paterson Evening News, were folded in an envelope, and weathered quite well to show an illustration and articles about the dedication of the building. Along with a history of the church, several coins and stamps were placed in the capsule. They include two Washington stamps, a one cent and a 3 cent, along with a two cent postage due stamp. Accompanying a silver Pius X medal, are several coins including a1907 quarter, a 1923 Buffalo nickel, a 1925 Liberty dime and a 1901 Liberty nickel. The Msgr. William Noé Field Archives and Special Collections Center is open Monday through Friday, 9:00 am to 5:00 pm. Research appointments are available. Please call 973-761-9476 or 973-275-2378. The exhibit, curated by Leonard Iannaccone and Kate Dodds, can be viewed from the hallway between the Archives and Walsh Gallery when the Library is open and will be up through May 21, 2012.